Ensuring that all fire alarms and detection systems are optimally designed, installed, and maintained is the key to ensuring high levels of fire safety. In the UK, 28 percent of all fire-related fatalities and casualties occur in dwellings that do not have a working fire alarm. These statistics suggest that the installation of fire detection and alarm system can significantly reduce the risk of death or injury resulting from fire incidents. At MODE Fire + Security, we help you reduce the risk of fire-related damages to your business or loved ones with our fire alarm systems. From basic fire alarms to enterprise-grade fire detection systems for large buildings, our collection features a wide range of solutions for diverse needs and preferences. In addition to this, we also offer installation and ongoing maintenance services to help you ensure the optimal performance of your fire alarm system and enhance the safety of your assets. 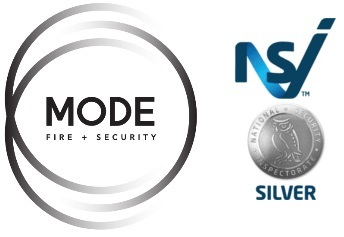 Whether you need a new fire alarm system for your new office or would just like a professional to assess the performance of your existing system, Mode Fire + Security has the experience, skills, and resources to look after your requirements. We have extensive experience of installing a multitude of fire control systems, ranging from fire detection solutions for a compact single zone to multi-zone systems. We can also schedule a site visit to design a customised solution that offers you maximum protection against fire-related damage and improves your compliance. Addressable Fire Systems — These are highly intelligent fire detection systems that is commonly used in warehouse, academic institutions, corporate facilities, and other large premises. Conventional Fire Alarms — A more cost-effective option, conventional fire alarms uses several different smoke detectors that are wired in dedicated circuits. Wireless Systems — A suitable alternative to addressable fire systems, wireless fire detection systems offer quick, easy, and non-disruptive installation. Aspirating Fire Systems — Aspirating fire systems draw air through a network of pipes to detect smoke before it is even visible to the human eye. Fire alarm systems require regular maintenance to provide you optimal protection. At MODE Fire + Security, we offer fire alarm inspection and maintenance services to help you strengthen your defence against fire incidents. In addition to this, we also provide ongoing maintenance service to help you avoid costly repairs. Our team not only assists you with routine maintenance, as well as responds to your emergency service calls in an efficient manner. At MODE Fire + Security, we also offer maintenance services for fire alarms that were installed by another company. When taking over the maintenance of a fire detection system, our experts will conduct an evaluation to determine if the solution is compliant with the relevant regulations at the time of commissioning. Once we have determined compliance, we will move forward with regular maintenance to help you protect your people and property from fire-related damages.